Muff- stage biological and mechanical filtration process provides maximum pond filtration. Large foam surface provides Increased filtration and beneficial bacteria growth. Includes 18 blo-balls, providing a high-surface area for beneficial bacteria to thrive and naturally clean pond pollutants. Unique external pressure indicator shows green when filter is performing properly, and shows red when filter cleaning Is necessary. 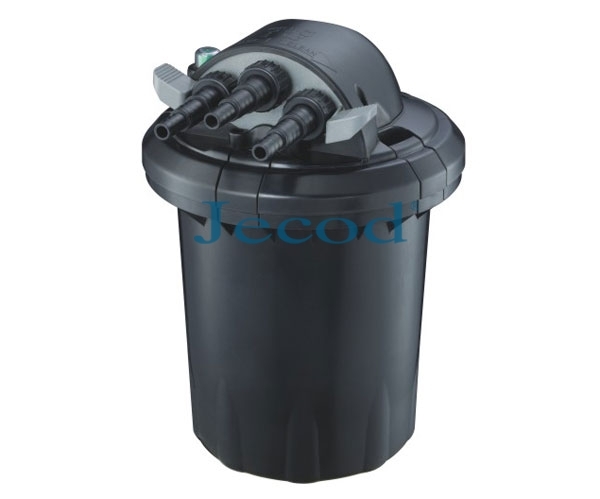 Unit is designed to be hidden and keep your pond environment beautiful-Jecod bio-filter is meant to be partially buried! Pressurized filter is ideal for use with waterfall applications. Easy and secure sealing mechanism ensures positive seal and easy operation. UV light incorporates special quartz glass,a highһquality clear material that allows virtually ail ultraһviolet light to pass, significantly increasing the performance of your filter. STAGE 1- MECHANICAL FILTRATION Water is pumped Into the filter creating the necessary pressure to begin the mechanical filtration stage. There are three phases in the mechanical filtration stage-coarse, medium-coarse and fine filtration Each phase uses a specially designed foam sponge to effectively remove all sizes of unwanted debris. STAGE 2- Bl OGICAL FILTRATION The biological filtration stage begins when water reaches the bottom of the filter. This stage uses bio-balls providing a habitat for beneficial bacteria to grow. These bacteria naturally convert harmful ammonia and other wastes into healthy nitrates that fertilize aquatic plants and support a healthy pond environment. STAGE 3 - UV FILTRATION The final filtering stage uses a low voltage, Ultra - Violet (UV)light located in the middle of your filter. Exposure to the UV light kills algae as the water passes upward through the filter on its way back to your pond.